This morning, we had a special time as part of our last day in Paris. 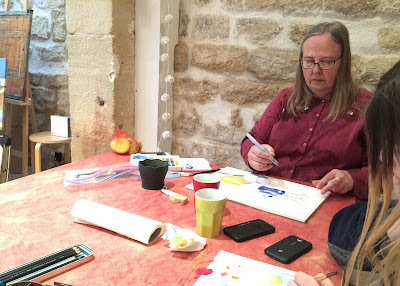 We went to the studio of Pauline Fraisse, a wonderful artist and teacher, for a three-hour watercolor workshop. The studio was a lovely space, full of light, and we were very excited as we unpacked all of the supplies we had brought from home. 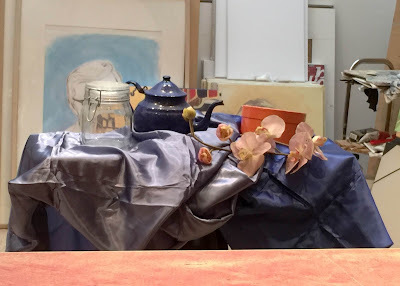 Pauline asked us what we'd like to work on, and we settled on a still life, which she set up for us. Pauline was a wonderful teacher. She started by having us draw "potato" shapes, just sketching in the different objects with no specificity. 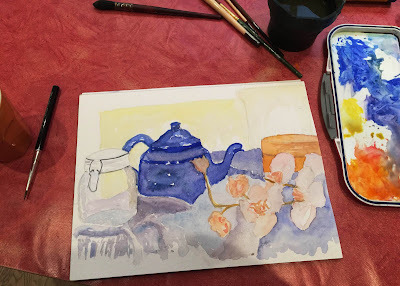 She taught us how to measure the lengths with our pencil so we could get the proportions right (I don't know how many drawing/painting classes I've taken and have never really gotten that). Then we made our sketches more specific, with lots of instruction from Pauline, until she was satisfied that we were ready to begin painting. Here's Deb, working on her painting. We spent about two of the hours working on our paintings, with Pauline leaning over our shoulders and giving us excellent advice. None of us finished our painting, but we left with a good idea of what we need to work on. I'm happy with the right side of my painting and the jar on the left, the rest, not so much. The fabric was so hard to do! Pauline brought out a book that was only about paintings of fabric, and we could see how skillful an artist has to be to capture that well. If you enjoy painting -- not only watercolor, but acrylic or oil as well -- consider enrolling in a workshop with Pauline. 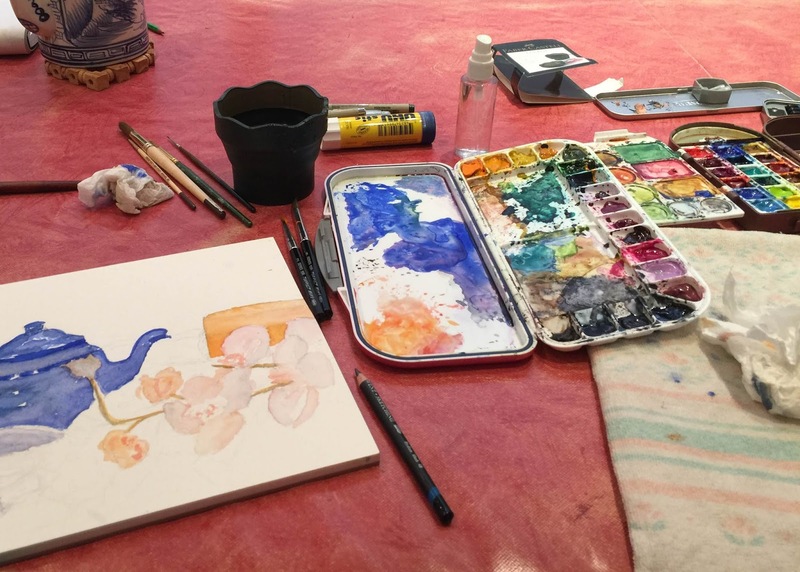 She offers not only in-studio workshops but ones in which painters are out and about in the city. She's an excellent teacher and I only wish I had more time with her! Today is a cold and rainy day in Paris. 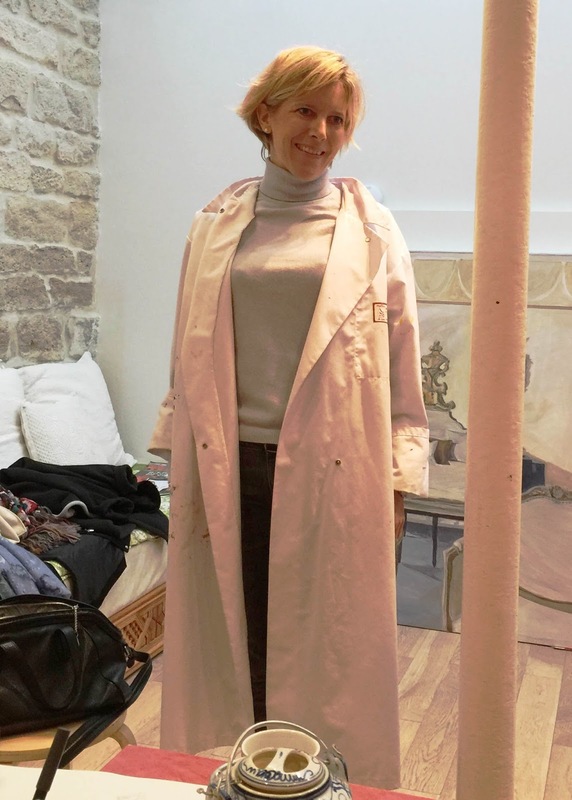 When we said goodbye to Pauline, we waited for a taxi on Avenue Parmentier, and by the time it arrived, we were chilled to the bone. 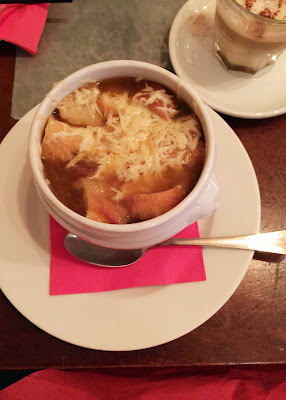 So there was nothing to do but go across the street to Cafe Chappe for some onion soup. I don't know how many times we've had onion soup in the past two weeks, but it wasn't enough. It's so delicious and satisfying. Ed says he'll definitely be making it when we get home. So it's time to pack up (actually, everyone but me is already packed, because I'm sitting here blogging) and say goodbye to Montmartre and to Paris. In spite of everything, we've had a wonderful time and we're going home with such great memories! Thank you so much for this lovely article. I keep such a wonderful memory of our class together! Welcome back anytime.